Upgrade and protect your home with custom gutter solutions and installation. Say goodbye to clogged gutters with our patented LeafGuard brand gutter guards. When you need a new roof we provide quality roof replacement and worry-free installation. Upgrade the value and aesthetics of your home with skylight installation. We offer custom insulation options to improve the comfort and function of your home all year long. Save money and improve the comfort of your home with our expert air sealing solutions. 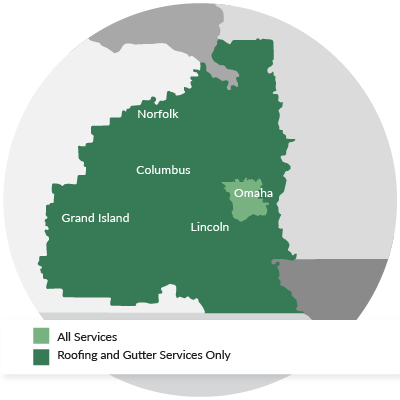 Since 2007, LeafGuard by Midlands Home Solutions has provided reliable gutter installation, roof repair, roof replacement & home insulation services to homeowners throughout Eastern Nebraska & Western Iowa. Custom gutters that are properly installed will protect your roof, your foundation and will prevent water from entering your home. Our LeafGuard gutters and downspouts are designed to never clog, prevent leaks and prevent ice dams. If you are looking for quality and affordable gutter installation services, you are in the right place! A strong roof is one of the most important parts in keeping your home protected. That is why our dedicated roofers takes their jobs so seriously. Our proven roof repair and roof replacement services will keep you and your family safe and give you peace of mind! For small roof leaks or damage we can identify the problem and provide a lasting roof repair solution. For larger and more severe problems, we also provide complete roof replacement services. We will help you every step of the way, from choosing a color best for your home to financing and everything in between. Trust LeafGuard by Midlands Home Solutions for long-lasting roof repair and roof replacement services. LeafGuard by Midlands Home Solutions also provides a wide range of home insulation services including attic insulation, blown-in insulation and cellulose insulation. Did you know that in both the warm and cold months home insulation is the best way to lower energy bills and improve home comfort? If you think you are paying too much or have difficulty staying comfortable we can take a look and recommend a few upgrades to stop the problem. We have combined decades of experience auditing homes and formulating dependable home insulation solutions. For all of our services we offer FREE estimates so don't hesitate to call 1-402-597-8788 or click today to schedule your FREE estimate! We proudly serve Omaha, Lincoln, Council Bluffs, Sioux City, Bellevue, Grand Island, Kearney, Fremont, Hastings, La Vista & nearby! "The basement is warmer and the drafts seem..."
If you feel that your home is wasting energy, you are probably right! Your family and your home deserve a total home energy efficiency plan! LeafGuard by Midlands Home Solutions can help ensure the best return on your energy saving investments. Not only that, but when your home is working efficiently, each room feels more comfortable-- it's nice to actually experience the result of an investment! LeafGuard by Midlands Home Solutions will perform a comprehensive home energy audit in Nebraska & Iowa to identify the problem areas in your home, while our free service estimates are a perfect avenue for maintenance, upgrades and a repair quote. Contact us today for your energy and comfort services or to schedule a home energy audit in Council Bluffs, Lincoln, Omaha, Grand Island, Bellevue, Sioux City, Fremont, Hastings, La Vista, Kearney, and the neighboring cities and towns.